The World Series has started and it’s the Cubs vs. the Indians. Most of the discussion has revolved around both teams’ long-standing issues winning the championship, with the Cubs futility stretching back to 1908, and the Indians to 1948. But what people aren’t talking about is how both of these teams got here: Through heavy use of analytics to build winning teams. Take it from these two World Series entrants: Analytics matter. So how do you use analytics to improve your irrigation business? And what metrics do you pay attention to? The first metric you need to monitor is your revenue per hour for each irrigation technician. Why? Because you’re in business to generate revenue and revenue per hour is a great way to not only see how your business is performing, but also is a great way to compare the productivity of each of your irrigation technicians. Revenue per hour, as the name implies, indicates how much revenue your technicians generate per hour of work. You can also calculate it as a daily number, but essentially, you’re taking a couple numbers - the amount of revenue a technician generated in a given period of time, and dividing that by the number of hours worked. It’s really that simple. What it is: This metric measures the actual production time your technicians work and excludes admin time. So, for example, if your technician spends a half hour in the morning in the office prepping for the day, that doesn’t count in your average revenue calculation. So the actual production time measurement tells you how much revenue is produced while the technician is working on customer jobs. Why to Use It: It’s a measure of how productive - from a revenue perspective - your technicians are while they’re actually doing work that generates revenue. As a result, it’s a good way to measure how much money your technicians make when they’re timed into customer jobs. The caveat: If you’re not using irrigation business software like The HindSite Solution, this can be much more difficult to track. But with our irrigation business field app, tracking this is a breeze. You simply time into office time, drive time and work time. What it Is: As the name implies, this is a measure of how productive your guys are for every second they’re working. So if they spend a lot of time in the morning before heading to a job or spend two hours getting parts from your distributor, the average revenue per technician using total time will tell you that. Your technician may be hyper-productive when he’s on the job, but if he wastes a lot of time in between jobs, his average revenue per technician number would show it. Why to Use It: It’s a measure of how productive - from a revenue perspective - your technicians are during the entirety of the day. It’s also easier to compute without irrigation business software - just take the total revenue produced by that technician and divide by the total hours worked. If you have a technician who spends more of his time on non-revenue producing activities like warranty work, he’s going to generate less revenue than other technicians. In a perfect world, you’ll want to examine both the actual production time and the total time numbers. As I mentioned earlier, just looking at one may be misleading. For example, you may have an employee who is hyper productive when he’s on the job site, but he spends as much time as possible avoiding the job site. Leveraging both numbers can be a great training opportunity. Take your employee aside and show them both numbers. Tell them you appreciate the work they do on the job, but they need to spend more time there. Your newer, less experienced technicians will likely have lower revenue per hour numbers. That’s OK. Give them time to get up to speed and monitor their improvement over time. Don’t keep the revenue per hour number to yourself. Publish it on a daily or weekly basis so your team knows you’re measuring it. Great employees are competitive and want to know how they’re performing. You’ll likely find that the process of simply measuring and sharing revenue per hour metrics for each of your technicians improves your revenue per hour by 5% or even 10%. So start by having a brief meeting and tell your team that you’re going to start measuring revenue per hour for each technician. Explain what it is and the impact it has on the company. Tell everyone that you’ll be sharing the number periodically. It’s also a great idea to create some type of incentive program based on revenue per hour. Set a goal, and if everyone on the team achieves the goal, reward the team. Or create individual rewards for achieving personal revenue per hour goals. It’s important to reinforce the value of measuring revenue per hour, and a great way to do that is with an incentive program. 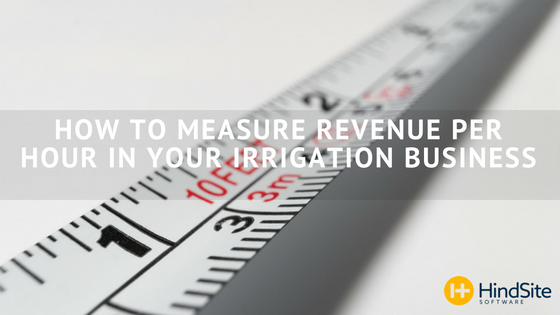 Measuring your irrigation technicians’ revenue per hour can not only help you understand how your technicians are performing, but it can also help you improve your business and grow your revenue. So give it a try, and drop me a line in the comments with your results.